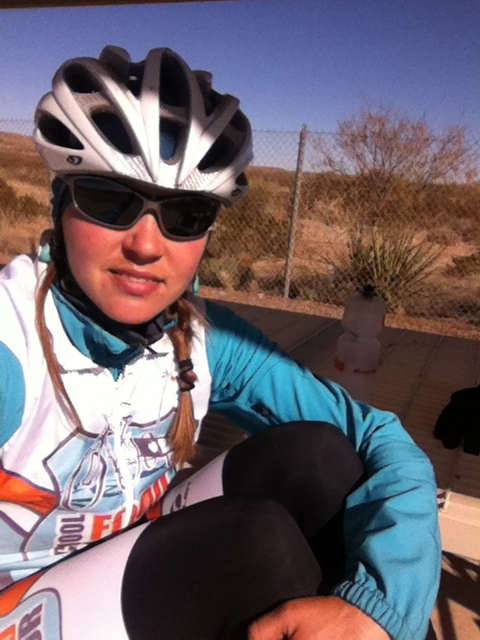 I can now say that I truly understand the full meaning of “cold weather riding”. Dad and I were holed up in Odessa, TX (the town that inspired Friday Night Lights!) 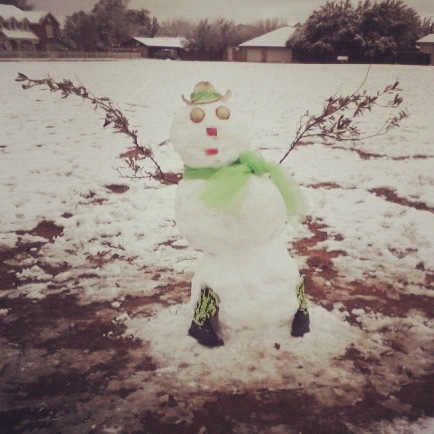 earlier this week while an ‘Arctic Blast’ powered through western Texas. We were able to hit the road again a few days ago and although the pavement was ice-free and the skies were blue, high temps hovered around the freezing mark. Add in a brisk wind and the conditions became truly frigid. It took all of my layers to keep me warm, and even then I had to jump in the support car and defrost for a few minutes here and there. Trying to stay warm during a quick roadside snack break. Somehow, the more inclement the weather, the more determined I become to pedal through the day. Hopefully this resolve will get me across the rest of Texas – it is one big state! Wow. This is where we separate the women from the girls. Love the snowman. We are rooting for you Sara! Met you today in Albertsons Grocery store parking lot. I wish I had met you earlier I would have tried to get you a speaking spot here. Stay warm and safe and God speed. Keep up the good work Sara!! !